1. 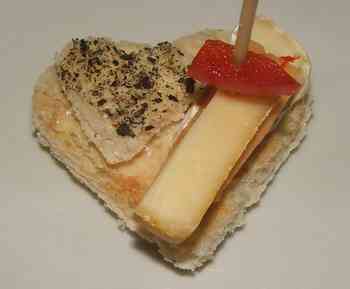 Toast the bread lightly und cut little canapé hearts from bread slices. 2. Spread the bread hearts with softened butter and arrange the three cheese slices. 3. Derorate with little bread-hearts and red bellí pepper strips. 4. Sprinkle the sandwick with ground black pepper. 5. Use toothpicks to fix the decoration elements.